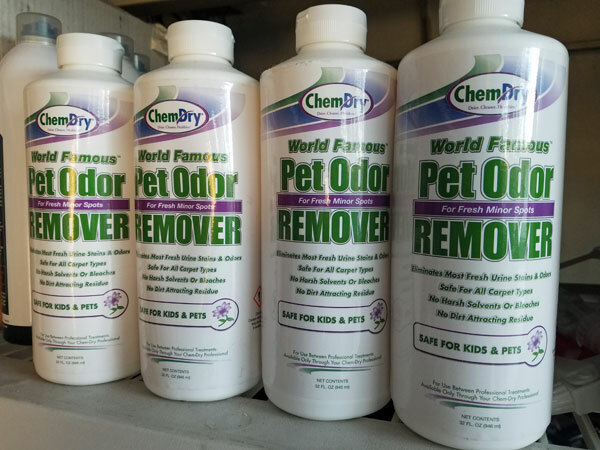 Chem-Dry's World Famous Pet Odor Remover is almost impossible to keep in stock. I'm a professional carpet cleaner in Tampa FL and I have a hard time keeping this little jewel of a cleaner in stock. The World Famous Pet Odor Remover is professional grade pet urine eliminator. If your pet pees on the carpet or the furniture then this is your go to cleaner. It's a green certified product that's completely safe pets and children. It can be used on all types of carpet and some upholstery. I use this product in my own Tampa FL home. It has never let me down on any pee related accidents in my home. I've even used it on my kids mattresses during their potty training days. It simple to use and incredibly effective at eliminating fresh urine stains. Unlike other pet odor removers it leaves no dirt attracting residues behind. That means the stain goes away and stays gone. Remove as much urine as possible from the carpet by blotting with paper or terry cloth towel. Soak the area with the Pet Odor Remover and remove the excess solution by blotting the area with a paper or terry cloth towel. Repeat the application of Pet Odor Remover and again remove the excess solution by blotting with a new paper or terry cloth towel. Cover the effected area with a clean dry terry cloth towel and allow it to remain damp for 24 hours. Then remove the towel and allow the spot to air dry. For Chem-Dry's Pet Odor Remover in Tampa FL call Chem-Dry of Tampa.